Germfree manufactures Laminar Flow Hoods for a range of biopharmaceutical applications. Our BVBI series of all-welded stainless steel, vertical clean air benches provide a high degree of localized control for critical aseptic processes and the handling of sterile products. HEPA-filtered air continuously bathes the work deck removing organisms and particulates 0.3 micron in size with an efficiency of 99.99%. HEPA filters are positioned above the work surface, providing vertical, unidirectional airflow within the cabinet. This ensures a smooth and uninterrupted flow of optimal ‘First Air’ to the process area. Germfree’s BVBI has an extra deep work area, which allows for maximum utilization and ease of placement of instruments and components. Laminar Flow Hoods provide unidirectional, ultra-clean air to enhance sterile product processing. They are widely used in cGMP-compliant production areas, USP 797 cleanrooms and 503B facilities. Germfree’s units are engineered to meet or exceed all advanced specifications for ISO 5 (Formerly Class 100) Laminar Flow Cabinets. These include: ISO 14644-1, USP 797, US Federal Standard 209E and IES Recommended Practices. A well-designed ISO Class 5 Laminar Flow Hood contributes to the operations of a cleanroom in relation to required Air Changes Per Hour (ACPH). 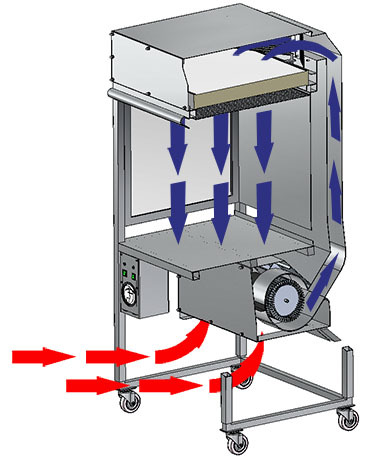 The BVBI provides an additional advantage by drawing in air located toward the floor. By filtering the room air with the highest potential particle count; the BVBI can augment overall cleanroom efficiency. The low position of the bottom air-intake ensures that return air is not pulled from the fan-filter ceiling modules. This facilitates the smooth downward flow of HEPA-filtered air for other operations conducted near the hood. Our BVBI design promotes overall efficiency of the cleanroom. Germfree’s BVBI Series of Laminar Flow Hoods are an effective platform for preparing non-hazardous Compounded Sterile Preparations (CSPs). 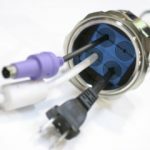 The deep work area is ideal for compounding and provides increased flexibility when using automated compounding devices. The units are constructed from all welded stainless steel with a pharmaceutical grade finish to ensure durability and ease of cleaning. 316L stainless steel is available. The BVBI features a SpillGuard along the back of the work deck. The fluorescent light housing is externally mounted for optimal lighting. The acrylic side panels allow for additional ambient light to enhance visibility. Read more about Validation Services offered by Germfree. Laminar Flow Workstations are designed to protect the product from airborne particulates in the ambient air. Personnel and the environment are not protected from materials located in the hood. The BVBI should not be used with biohazardous materials, toxins, anticancer agents, radionuclides, or hazardous chemicals. 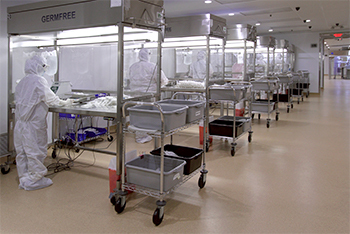 GERMFREE manufactures complete lines of Biological Safety Cabinets, Pharmaceutical Isolators, Fume Capture Systems and other containment equipment to protect personnel and the environment as well as the product. Germfree’s BVBI Series of Vertical Unidirectional Airflow Cabinets provide a wide range of solutions for biopharmaceutical aseptic processing. Contact Germfree about your specific sterile product requirements. 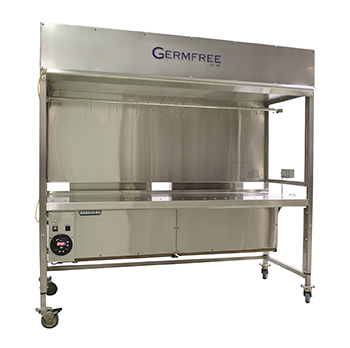 Germfree also designs and manufactures Custom Laminar Flow Equipment and Downflow Booths. Please contact us for the diagrams of the specific model you are interested in.